Science communicator, follow me on Twitter and Instagram. 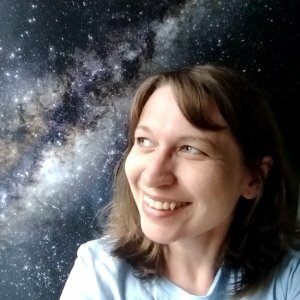 Dr Helen Klus is a science communicator and astronomer with a background in physics and philosophy. She is the author of the How We Came to Know the Cosmos series. Klus currently works at the Royal Astronomical Society, which promotes astronomy, solar-system science, and geophysics around the world. Klus is an assistant editor for astronomy journal MNRAS, and has represented the society at numerous conferences across the UK, on television, radio, in newspapers and magazines. Klus has interviewed numerous astronomers, including Astronomer Royal Sir Martin Rees and PI of the Juno mission Scott Bolton. Klus and recently gave the sold-out talk "Women and the Stars: How women have shaped our understanding of the universe". She also works on @RoyalAstroSoc, and runs women.ras.ac.uk, @RAS_Women, and @RAS_Journals. Klus was previously shortlisted for the Wellcome Trust Science Writing Prize in association with the 'Guardian' and the 'Observer'. Klus gained her PhD in Physics (University of Southampton, 2015) using data from X-ray telescopes to study explosions on neutron stars. Neutron stars may be the fastest spinning and most magnetic objects in the universe, some have magnetic fields so high that they exhibit quantum-like behaviour. Klus also has a BSc in Astronomy and Philosophy (University of Sheffield, 2006) and an MA in Philosophy of Physics (University of Leeds, 2008), where she specialised in the many worlds approach to quantum mechanics. Dr Helen Klus from the Royal Astronomical Society interviews astronomers at the European Week of Astronomy and Space Science, the Gaia Data Release, and the RAS-Juno Europlanet Meeting. ARIEL PI Giovanna Tinetti, @DrJoVian, and Michiel Min, discuss the @ArielTelescope, which will survey of hundreds of transiting exoplanet atmospheres, with @mariekebaan and @RobertMMassey at #ewass2018. Women and the Stars: How women have shaped our understanding of the universe, Westminster Reference Library, September 2018 and Royal Astronomical Society, October 2018. BeXRB 2014, Valencia, Spain, July 2014, a summary of my talk is available here. National Astronomy Meeting, Portsmouth, UK, June 2014, a summary of my talk is available here. New Results in X-ray Astronomy, Southampton, UK, September 2013. Physics at the Magnetospheric Boundary, Geneva, Switzerland, June 2013, a summary of my talk is available here. Half a century of X-ray Astronomy, Mykonos, Greece, September 2012. How We Came to Know the Cosmos: Space and Time (2017). How We Came to Know the Cosmos: Light and Matter (2017). Why Are There So Few Female Scientists? (2014) The Toast. Armchair Explorers: how members of the public are taking an active role in the search for other worlds (2011) Wellcome Trust Blog (shortlisted for the Wellcome Trust Science Writing Prize, in association with the 'Guardian' and the 'Observer'). Klus, H., 2015, 'Breaking the quantum limit: the magnetic field of neutron stars in extra-galactic Be X-ray binaries', PhD thesis. Klus, H., Ho, W. C. G., Coe, M. J., Corbet, R. H. D., and Townsend, L. J., 2014, 'Spin period change and the magnetic fields of neutron stars in Be X-ray binaries in the Small Magellanic Cloud', MNRAS, 437, 3863-3882. Ho, W. C. G, Klus, H., Coe, M. J., and Andersson, N., 2014, 'Equilibrium spin pulsars unite neutron star populations', MNRAS, 437, 3664-3669. Klus, H., Bartlett, E. S., Bird, A. J., Coe, M. J., Corbet, R. H. D., and Udalski, A., 2013, 'Swift J045106.8-694803; a highly magnetised neutron star in the Large Magellanic Cloud', MNRAS, 428, 3607-3617. Haberl, F., Sturm, R., Tsujimoto, M., Wada, Q., Ebisawa, K., Miller, E., Coe, M. J., Klus, H., and Beardmore, A. P., 2012, 'SXP523 = Suzaku J0102-7204 = 2XMM J010247.4-720449, a Be/X-ray binary pulsar in the SMC', Astron. Telegram, 4648. All views expressed on thestargarden.co.uk are my own, and do not reflect the views of the RAS.